Earlier in November, Speedrun.com, a huge database for most games’ speedrunning information, was subject to a security breach. This saw some users’ accounts compromised, including those of moderators. As a result, many leaderboards had false times submitted, and some boards even had many of their legitimate times deleted. Upon rolling the site back to an earlier version, the admins prompted all users to reset their passwords. A new Majora’s Mask TAS (Tool Assisted Speedrun) competition has been launched! Run by TASer Eumeus (whom I’ve interviewed previously), this competition challenges runners and TASers of the game to various challenges, which are submitted to organizers by a particular deadline. You can find out more information about the competition on the Discord server, and for more information about the latest task, have a gander at the Final Split segment! 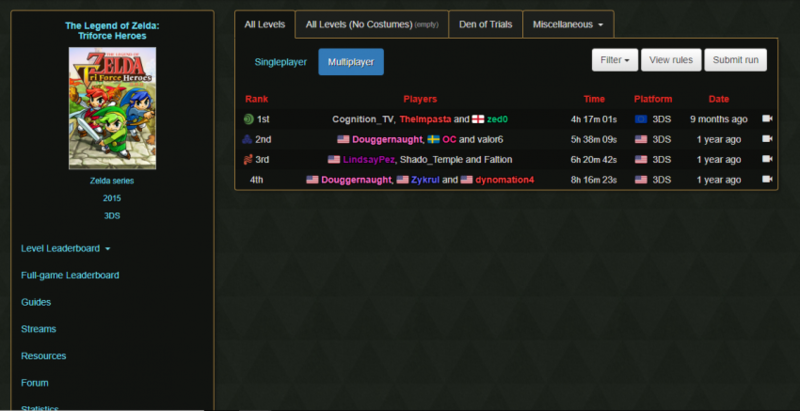 Also this week, the winner of the Oracle of Seasons tournament was announced. Runner Sagaz won out against their opponent, dragonc0. All competitors and organizers thoroughly enjoyed the event, and will possibly be hosting another Oracles tournament in the future. This week, we’re delving into the world of The Minish Cap. Anyone who caught the article from a few weeks ago will remember the featured Minish Cap World Record Progression video, and that a skip mentioned in said video was called Flipper Skip. Well, I thought it was high time we covered this, and the exploits that are required to achieve it. The need for this trick is a sidequest the player is required to complete in order to access the third temple, The Temple of Droplets. This temple is surrounded by water, which Link cannot normally enter without an item called, you guessed it, the “flippers!” These allow Link to swim through bodies of water, and can be found after completing a moderately long sidequest. Of course, as speedrunners, that’s not our cup of tea. 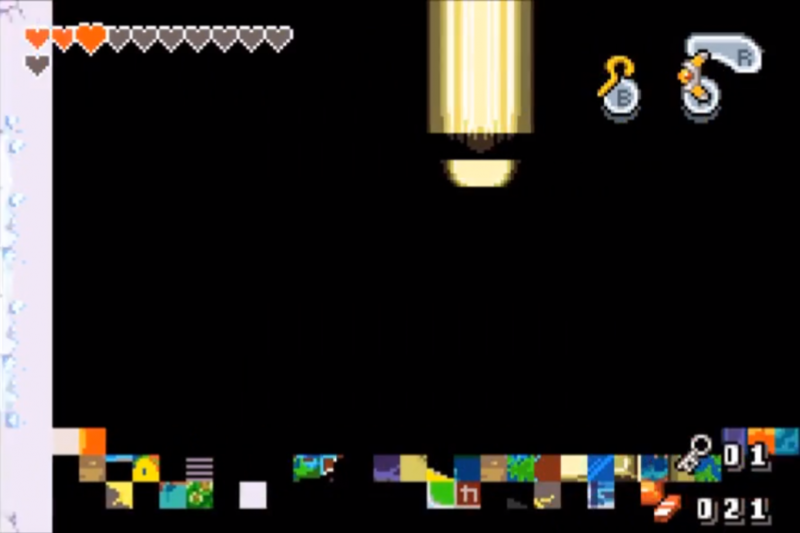 By pressing the ocarina button a single frame after entering a staircase (this is just one method), we can activate a state known as Ocarina Glitch. In this state, we can walk through objects and above rooms quite freely. In dungeons, we will preserve our height, unless we run up a staircase, where we will gain the appropriate height. We cannot, however, easily lose this height – we are limited to staying put or ascending. Transitioning between rooms, however, allows us to lose height, depending on where we appear on the following screen. In this state, lots of actions will softlock the game, including rolling and crashing with the Pegasus Boots. For Flipper Skip, a specific set-up of this glitch is required, one which activates on the opening of a door. 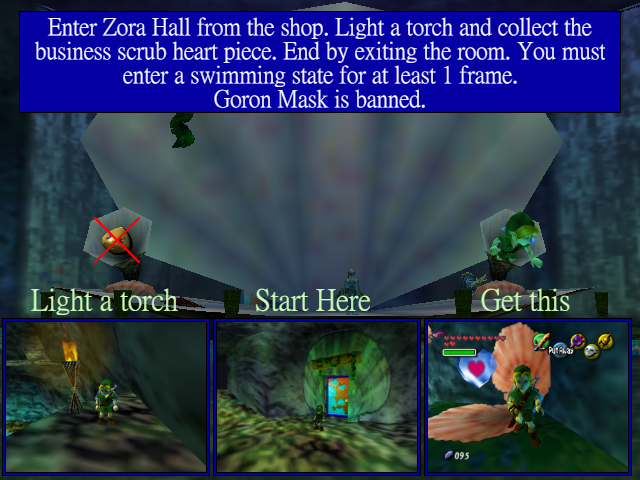 To do this, the player must die on the same frame as they open the door, then immediately be revived by a fairy. This will keep the door open, allowing Ocarina Glitch to be performed. Once this is done, we can safely walk across the water, and enter the dungeon. Where we’re immediately presented with another problem. 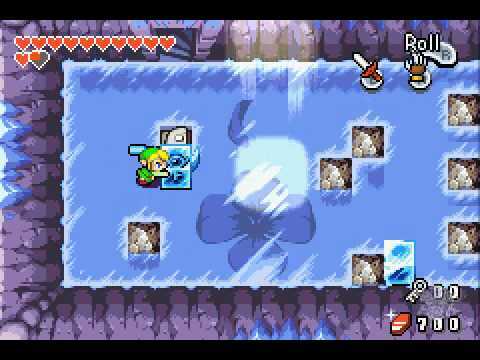 Being a water temple, it comes as no surprise that it contains quite a lot of… water. Normally, we’d just shrug this off and use our Flippers to swim through. Unfortunately, as you might have noticed, we’re doing our best to avoid them, so what now? We can use a glitch called Boss Door Clipping. Not quite what it says on the tin, this glitch allows us to enter a room without triggering the transition, meaning we can walk around this room without loading any actors. First off we need to acquire the Big Key, which, surprisingly, we can do without the flippers. After this, we need to save and quit, then leave the dungeon and active Ocarina Glitch. After re-entering the dungeon, we can approach the boss door. 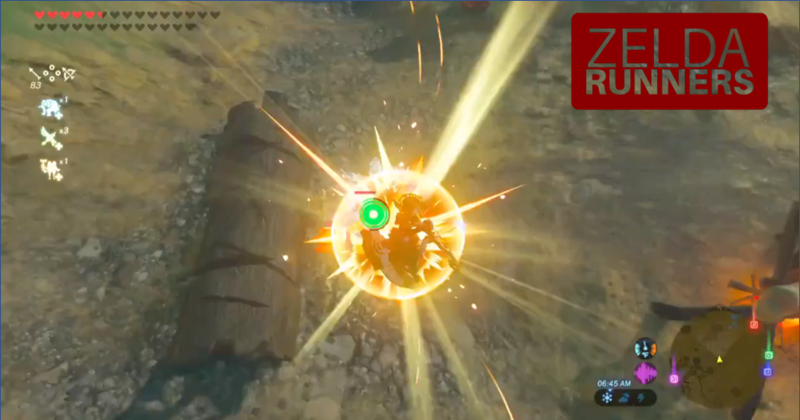 Throw the Magical Boomerang away from the door, then open it and hold down the Boomerang button until Link is past the loading zone. We should now be standing in the Boss room, while the camera stays focused on the previous screen. This is where things start to get tricky. Roll to the right three times, then roll against the wall. We’re looking for a very, very specific position here, so we’re going to use the Cane of Pacci to line ourselves up properly. On using the cane: if you see a single flash in the bottom right of the screen, you aren’t quite positioned correctly. In this case, walk down a little, then roll up again for another chance. If, after you’ve used the cane, you see a sparkling after the initial flash, you’re in the correct position! Now walk to the right and pause immediately after the screen transition (and equip the sword over the Cane). Now walk upwards and to the right. 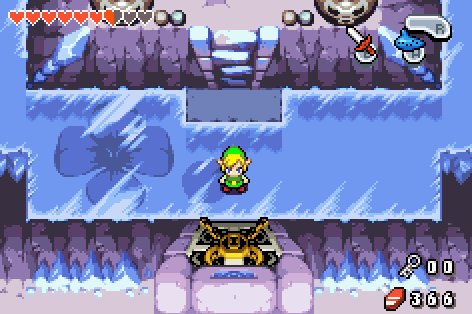 The white screen transition will have cancelled Ocarina Glitch, so we can jump down this ledge into the Blue Warp room. From here, we can complete the dungeon as normal. This skip saves around 90 seconds in an any% run. This week, my spotlight is on a Breath of the Wild runner, who focuses on shorter categories such as Any%. I had a chat to harmjan about their experience with the game and its community. harmjan: I am harmjan, I am 15 years old and I run The Legend of Zelda: Breath of the Wild. My main category currently is any% No amiibo, where I currently have a 40:17 time, and I hold the world record in two “Die%” categories: “Fall Into Ice Water and Die” (my time is 1:37.210) and “Die to a Guardian%” (my time is 3:50.750). EC: You’ve run quite the range of meme categories; what’s your motivation behind these runs? Obviously, there’s less competition, but do you find them more entertaining than the more “serious” categories? harmjan: The reason I have run meme categories is just for fun. I don’t run them often, but I like to do it when I’m running low on time – for example, a longer run dies and I don’t have time to start a new attempt, or just don’t have time for full runs at all. EC: Would you ever consider running other categories within the game, such as All Dungeons or All Main Quests? harmjan: Yes, I have a few longer categories I am planning on learning – 100% and all shrines. The reason I want to learn 100% is, while it is a very long category, it’s now more accessible for runners, as we’ve just recently introduced a new sleepbreak rule. This means we’re allowed to take two sleep breaks of up to nine hours during the run without this counting towards our final time. This is a huge change, as runners no longer have to dedicate 30 hours straight to attempt the run. EC: Do you think the recent breakthroughs in Breath of the Wild will attract more runners to the game? It could lead to more competition, but perhaps that’s a good thing? harmjan: Yes, I feel like the recent breakthroughs will make this game more attractive. Before them, the game was pretty much glitchless. We had some glitches and weird stuff happen, but nothing useful in runs. Since the discovery of Bullet Time Bounce, SVA, a runner who ran this game a year ago, has returned to any%, and I’ve heard there are more previous runners on their way to return. EC: So far you’ve focused mainly on Breath of the Wild. What is it about this game that draws you to it over other games? 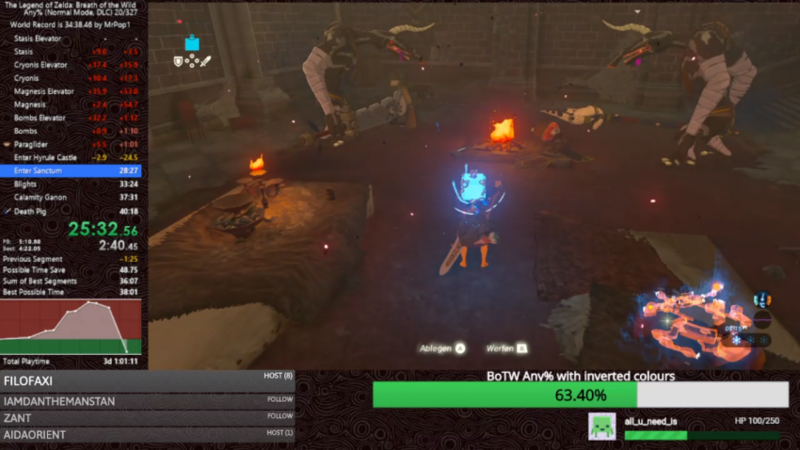 Would you ever consider speedrunning other Zelda titles? 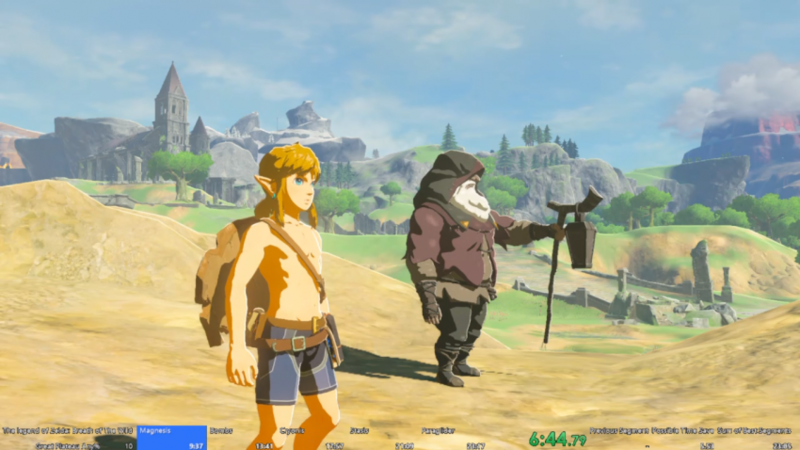 harmjan: It would probably Breath of the Wild Any%, as it’s such a fast paced run with a lot of fun strats and I really want to push for a good time. It hasn’t been easy but I am pretty sure I should have a big personal best soon. Potentially with new glitches we can see the Any% category go sub 30 – the main runner, rasen, has a 30:40 sum of best, so it’s definitely close to being possible. You can find harmjan on their Twitter account, and catch their runs on their Twitch channel. Really-Really-Long-a-thon 2 – 1st December ~ 15th December – A marathon so long it appears in two consecutive Runners articles? Exclusively featuring categories 4 hours or over, this is definitely something you can stick on in the background. Winter Pride – 6th December ~ 10th December – A 4 day marathon to raise money for The Trevor Project, an organization providing crisis intervention and suicide prevention services to the LGBTQ community. The marathon concludes with a huge 7 hour Zelda block, so it’s not to be missed! RGL TV’s Coin Op Classic – 8th December ~ 9th December – A collection of short, sweet retro games. A perfect marathon if you’re running low on time and want a quick fix of speedrunning content. Majora’s Mask Competition Task #1 – Think you’ve got what it takes to take part in the Majora’s Mask TAS competition I mentioned earlier? I’ll leave you with the puzzle image, see how much you can figure out! Euan is the host of Zelda Dungeon’s Speedrunning series, Zelda Runners. He can be found on Twitter and Discord (Euan Crombie#9657), and, from this week onwards, will be inserting at least one Triforce Heroes reference into every article he writes.